A LinkedIn job description has shed some light on the upcoming graphics card. Nvidia has been keeping very quiet about the GTX 1080 Ti, but the company has apparently confirmed its existence in a job description on LinkedIn (via PC World). The job opening is no longer accepting applications, but it was for a "Senior Marketing Manager – GeForce, Gamer Loyalty & Advocacy." 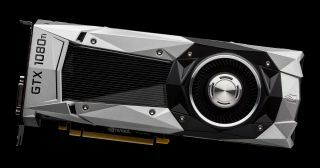 Under the "targeted spot prizes to drive sentiment, reward behavior, and grow advocates" heading, Nvidia outlined a potential plan for the upcoming graphics card. It appears the company wants to reward users of the GTX 980 Ti by giving them "first spot in line for 1080 Ti pre-orders." Alternatively, there could be a "Step Up" offer, which will presumably provide some sort of reward or incentive for upgrading to the new model. Elsewhere in the listing we are introduced to Club GeForce, a program where GeForce Experience users gain regular rewards. "I think of GFE Rewards as more than giveaways—it's a club with exclusive benefits for GFE users," says the job description. Annual benefits include a free indie game, a free custom skin or in-game item for a AAA game every few months, early beta access for Talos and Nvidia first party content, and exclusive hardware discounts for gaming gear. There will also be weekly giveaways with prizes such as free game codes, in-game currency, early beta access to certain games, gaming accessories, and tickets to gaming events like Blizzcon and PAX. Users will also be rewarded for submitting bug reports or contributing "useful feature enhancement requests." The most active forum users will also be given game codes, as will the users who "rank most negative and position on our sentiment tools." In addition, there will also be a Club GeForce Elite subscription service which will be implemented as the program develops. The fee will be $10 per month, and users will receive a rotating bundle of free games from the GFE app store (which doesn't actually exist yet), free GeForce PC in the cloud subscription (GeForce Now, perhaps? ), and exclusive skins, in-game items, and GeForce gear. As before, we anticipate an announcement for the 1080 Ti at CES in January. Pricing and specifications haven't been disclosed yet, but it will most likely look a lot like a Titan X but with GDDR5 instead of GDDR5X.